calling… iPhone App Review: Search Your Contacts Fast! 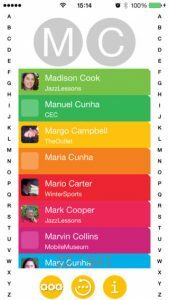 This app is perfect for anyone who has a long, unwieldy contacts list. Rather than having to scroll through a long list of people, this app lets you quickly zero in on the relevant names as you navigate using a dual-scrolling technique. 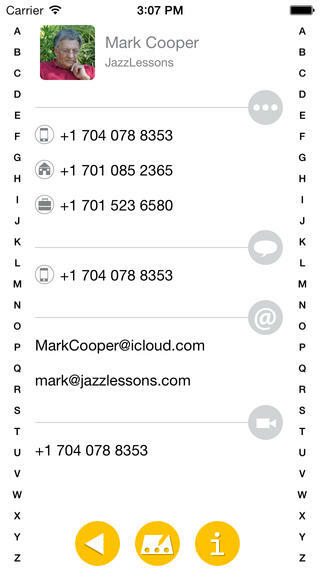 Rather than having to type in the name of your contact, calling… relies on a clever, fast scrolling system. Using your left thumb, you scroll down the alphabet on the left side of the screen to pick the first letter in the contact’s name. WIth your other thumb, you can scroll down the right side of the screen to select the second letter in the contact name. Finding the right name takes mere moments! One thing that is great about calling… is the fact that the app has a wide variety of customization options. 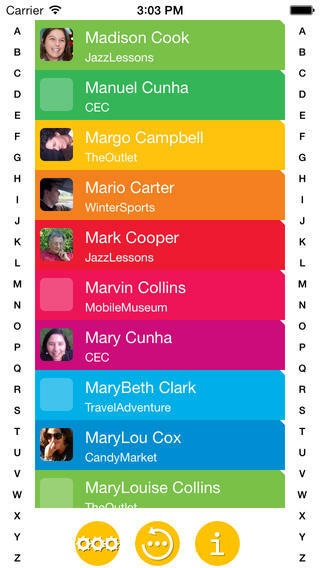 You can choose from one of over 20 skins, adding a splash of custom color to your contacts list. From the search results you can quick dial your contact, view their detailed information, send messages, emails, or start up a FaceTime chat. calling… has a great interface that is really intuitive. It may not be of interest to people with short contact lists, however. In short, calling… is kind of a must-have app for anyone with a long, long list of contacts. 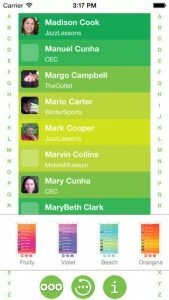 If you have a large list of business contacts, a huge family, or just a lot of friends, this helpful app helps you cut through the clutter in your contacts list. Plus, it’s also an attractive app! calling…requires iOS 6.0 or later. Compatible with iPhone, iPad, and iPod touch. This app is optimized for iPhone 5.